Jurgen Klopp has a selection headache in midfield as Liverpool prepare to face Man United, with at least one player set to be unfortunate to miss out. The Reds are occasionally criticised for lacking depth in certain areas, but that cannot be said for their options in the middle of the park. 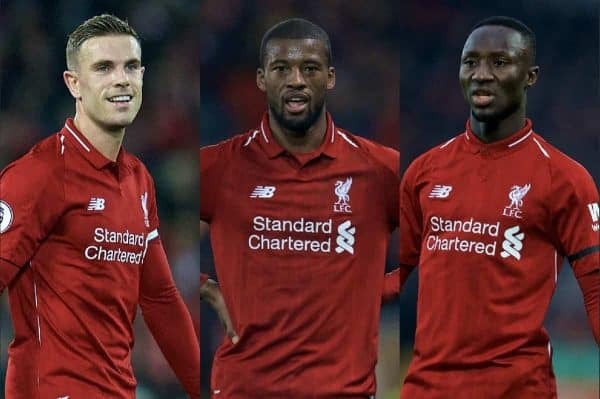 Klopp has five strong players in Fabinho, Jordan Henderson, Gini Wijnaldum, James Milner and Naby Keita, with Adam Lallana and Xherdan Shaqiri also more attacking options. All this in the continued absence of Alex Oxlade-Chamberlain, too. Liverpool their biggest game of the season so far on Sunday, heading to Old Trafford to face a United side thriving under Ole Gunnar Solskjaer and aiming to dent their rivals’ title chances. So who does Klopp start in midfield? Henry Jackson (@HenryJackson87) spoke to Jack Lusby (@jacklusby_), Joel Rabinowitz (@joel_archie), Adam Smith (@Adam_Smith_82) and Matt Ladson (@mattladson) to discuss who they would go with ahead of the hotly anticipated game. 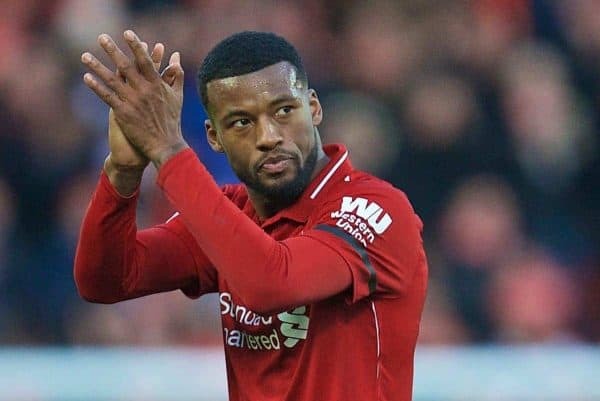 ADAM: I’ve long been a Henderson fan and I thought talk of him playing centre-back against Bayern, in order to ensure Fabinho made it into the middle of the park, was dismissive of the captain’s ability. I was made up to see him produce a man-of-the-match performance in the Champions League and he’d be the first name on my teamsheet at Old Trafford as a result. Personally, I’d be tempted to stick with the same midfield and defence, only with Van Dijk coming back in for Matip, with Fabinho at the back. That doesn’t leave us with much off the bench, though, and personally I remain unconvinced that Milner is a solution to midfield problems. JOEL: The big caveat I should add here is that I would also start Fabinho, but alongside Van Dijk at the back. United’s most dangerous zone is that attacking left position with Paul Pogba and Marcus Rashford and I feel more confident in Fabinho playing there than Matip, who I think they would target as a clear weakness. Henderson was superb against Bayern and you need his experience and leadership in these kind of games. Gini needs no explanation: he’s undroppable for me. I would also start Keita as he’s starting to find some form finally after growing in confidence in recent games. I wouldn’t halt his momentum by dropping him now and he brings that creative spark and unpredictably which offers something different to the rest of Klopp’s midfield options. 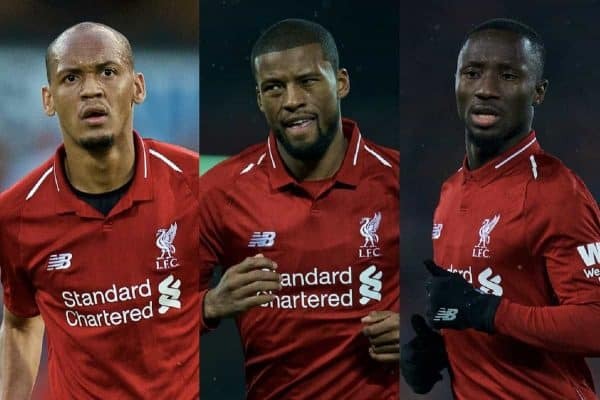 I think there is a good blend of defensive steel and attacking guile in that trio, with Fabinho able to step out of defence and use his distribution from deep. HENRY: Let me start off by saying that this is in no way a slight against Keita’s recent form, which has been excellent. Leaving him out is done with a heavy heart, but given the opponent, he feels like the most expendable. It’s fair to say his season as a whole has been underwhelming, and in the red-hot Old Trafford atmosphere, with the game being played at a frantic pace, I would have a lingering fear that he could suddenly be a weak link. Adam’s idea to keep things the same as Bayern is one I thought about, but Fabinho‘s ability to deal with Pogba means him returning to the No. 6 role is imperative. Henderson had his best game of the season against Bayern and knows all about the fixture, so he should keep his place. Meanwhile, Gini is undroppable at the moment and one of the most underrated players in the Premier League. Keita could have a big impact off the substitutes’ bench when legs are tiring, while Milner’s know-how could also be handy. A lack of guile? Possibly. But imposing characters are required more when it’s United away. 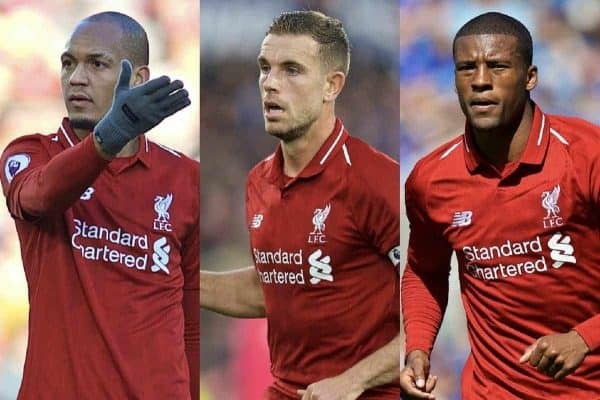 MATT: I can certainly see the rationale behind a midfield of Fabinho, Henderson and Wijnaldum, but it lacks goal threat and the ability to play vertically. Keita is in good form at the moment and he can get some joy against United’s midfield, either drawing fouls from Ander Herrera, or by dribbling past Nemanja Matic. Wijnaldum is absolutely vital to what Liverpool do in the middle, leaving only one more position. And for me, Fabinho offers more than Henderson. Superb at breaking up play, excellent on the ball and works excellently alongside Wijnaldum. 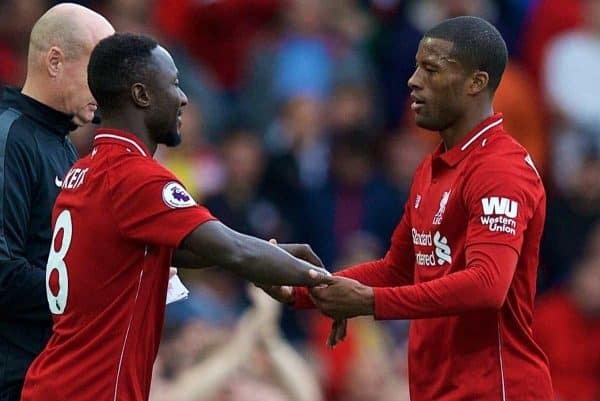 JACK: It’s a difficult one after Henderson performed so well on Tuesday, but I can’t look past the three best midfielders at the club: Fabinho, Wijnaldum and Keita. I believe last time out in the league was the first game they have started together in a three-man midfield, and they produced a fluid, top-level display. 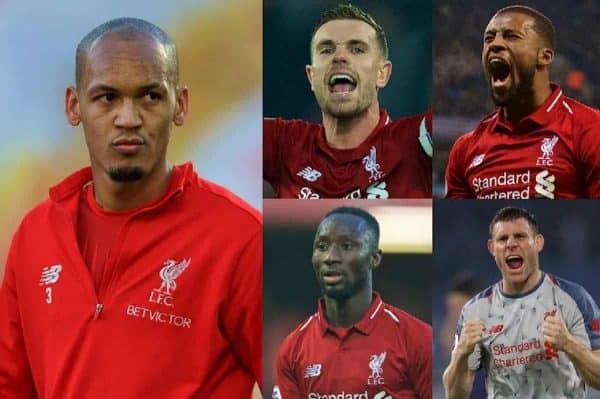 There is an argument to be made for Fabinho being better than Matip at centre-back, but with Van Dijk back there should be no concern, and the Brazilian should revert to his best role. Fabinho starting deep, which saw him shine against United in the reverse fixture in December, gives both Wijnaldum and Keita the license to push forward and penetrate. We need a front-footed approach on Sunday, and this midfield would ensure that.